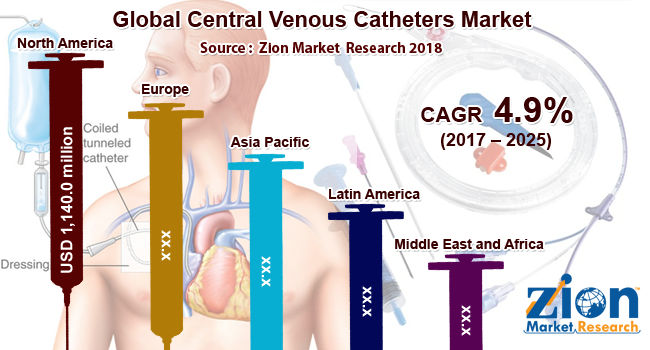 Global central venous catheters market expected to reach USD 1,140.0 million by 2025, growing at a CAGR of 4.9% between 2017 and 2025. The non-antimicrobial coated central venous catheters segment contributed a major market share of over 64% in 2017. But, as there are high chances of getting bloodstream infections among the recipients the manufacturers are focusing on the production of the antimicrobial coated catheters and are investing majorly in the R&D activities to combat this situation. Thus antimicrobial coated catheters are expected to account for a high CAGR in the coming years. The prominent market players maintain the competitive edge in the global market by making investments in the mergers and acquisitions and by increasing their product portfolio. For instance, in June 2016, Kimal had launched their new product Altius RT Acute Haemodialysis Catheter which was designed to improve the patient’s safety.